After reading about the dustcart being sent to Bolivia, I read today in Business News Americas that the Bolivian government is investing large sums of money in waste collection, although the article does not exactly say where the improvements are to be made. Water and sewage services are to be improved as well. Sending a dustcart to Bolivia? The first story of the year that caught my eye is somewhat unusual. A lady from Berlin is raising money to send a dustcart to Samaipata (original story here). The story got me thinking – rubbish being collected by a lorry rather than a dustcart I could imagine, but did I see this happening during my visit anywhere? Was rubbish such a problem? So I went back through all my photographs – and it took me a while to find any pictures with rubbish on them. 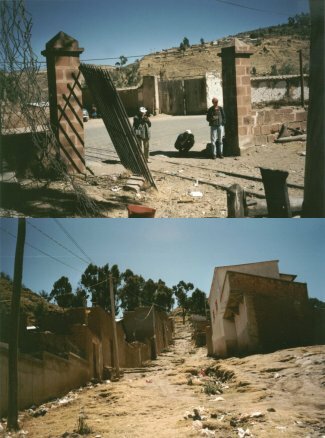 On almost all of them there was none to be seen, not in Sucre, Potosi, La Paz, Cochabamba or Villa Tunari. On closer inspection I did find two examples – the (closed) railway station in Sucre, and the hill up to the shines in Copacabana. Even in the poorest areas such as El Alto I cannot find any. That said, there was often a problem with sewage. 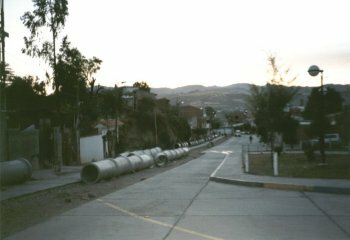 I remember the filthy colour of the river flowing through La Paz, or the blocked toilets in Cochabamba. Perhaps after the dustcart, someone should start collecting for a sewage treatment programme? You are currently browsing the Amigos de Sucre blog archives for January, 2008.